When ministers teach a combination of the law that came through Moses and blend it with the gospel of Jesus Christ as a Christian application, it will leave people confused and often condemned. Teaching those old commandments as a way of life does not reduce sin but leads to an increase in sin. Israel was trapped in a system that could not bring life or righteousness. They needed to be shown their inability to abide by the law and be redirected to something better. Jesus is about to teach the law in a way they had never heard it before during the Sermon on the Mount. 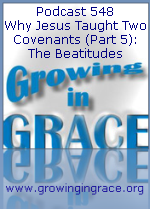 He begins with something known as the Beatitudes. These were not given to get people to try harder. These are blessings that would eventually be fulfilled by Jesus.